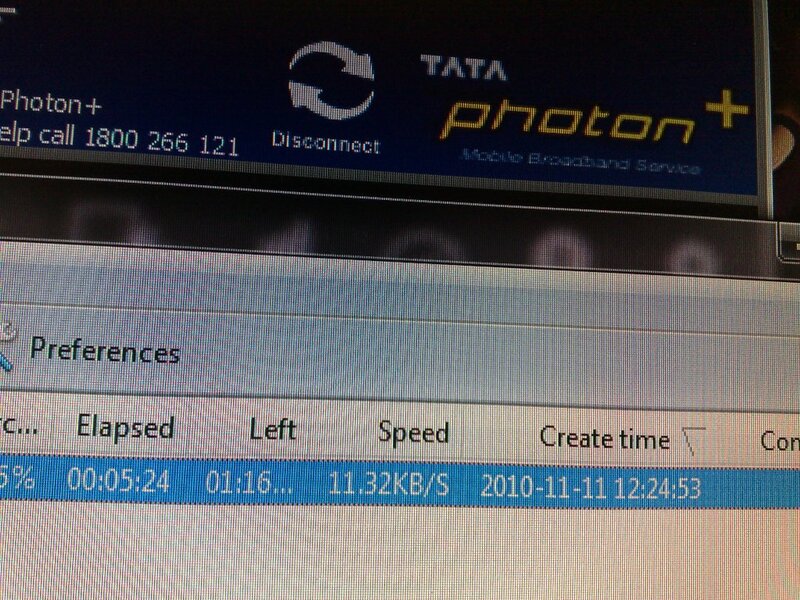 Hi I’m Sourav and I purchased a Tata Photon Plus (prepaid)usb modem connection on 9/11/2010 from jadavpur, kolkata.My Photon number is 9230138537. I purchased this after confirming about the download speed from TATA PHOTON Customer care about 4 times and the retailer from whom I purchased the Tata Photon Plus modem.They assured me that in my unlimited plan of Rs 700 I will get a speed of 3.1MBPS i.e transfer rate or download rate will be ranging between 500 kbps -700 kbps for first 1GB ,after that speed will slow down to 1MBPS i.e transfer rate or download rate will be ranging between 50kbps -155 kbps and will be valid foe 30 days. I purchased this modem with Rs2300 and got 1GB of free usage, but the retailer could not show me speed going above 12kbps.He told me to take this modem home and try on my Personal Computer.But the results were same I was getting a maximum speed of 20 kbps and now its worse , I’m getting between 5kbps to 11 kbps.The next day I recharged with Rs 700 unlimited plan but it was same .I was getting speeds between 5kbps-11 kbps. I complained about the very very slow speed issue to TATA PHOTON Customer care and the have sent me an engineer to my residence.But the engineer could do nothing.I also contacted with the regional office head and he is telling that I’m getting very good speed and nothing can be done about the speed.They didn’t even replaced my modem telling me there are no modem in the stock. I am frustrated calling the customer care several times but with no use at all. If the problem is not solved .I want to handover my modem and want refund of Rs 2300 that I paid for the modem. Mr shiva kumar p,sr manager of Tata photon customer care OF AP.he is also not responding. Tata now starting looting public by selling faulty modem to indian public. Me too facing the same issue. With lots of hopes I purchased this USB. Finally the speed is 10kbps. For this stupid speed why we need to buy this… 🙁 🙁 🙁 :'(…. me too.but this problem only for kolkata.in mumbai i use photon+ i can got high speed.